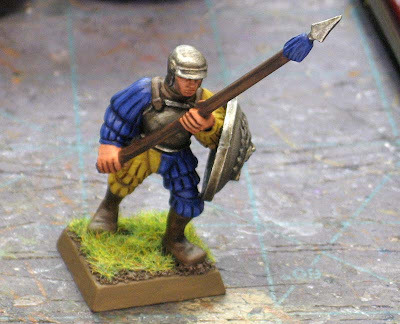 As part of the Back to Basics series, this post looks at painting a "Fantasy" model. 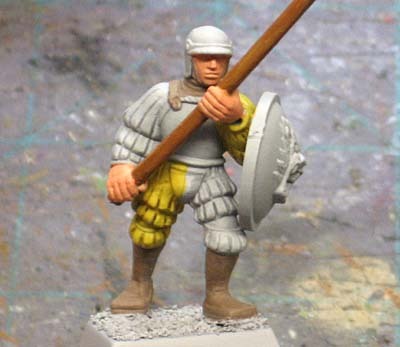 Today we're going to be painting a Norland soldier. 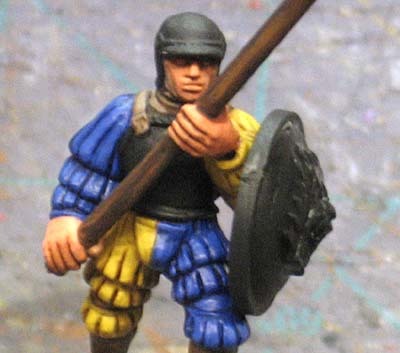 I chose this guy because he had a quartered scheme that allowed me to show another way to paint models and use some different colors (yellow). Again, I'm going to paint him by sticking to simple techniques like base coating, washing and highlighting. Nothing fancy like wet blending or any other "advanced" techniques. Nordland is the Empire's only coastal province, and is thus a frequent target for raiders. To counter these attacks, Nordland boasts a strong army of battle-ready soldiers, many of whom even spend time aboard the Empire's warships. Nordland's soldiers wear bright blues and yellows and their heraldry often features sea eagles, as well as boats and other nautical iconography. Seemed like cool colors and interesting enough. You don't see many people painting yellow either, so I thought it might help ease some reservations about painting yellow if I gave it a go in the Basics series here. I started the model with a light grey primer. 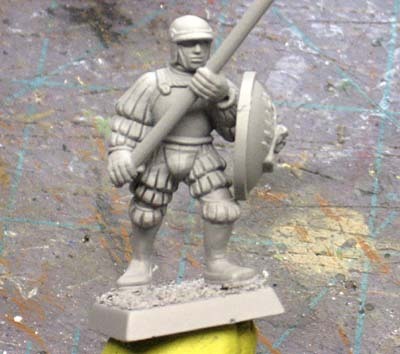 I could have used white for the same effect, but I find white to be difficult to see all the details on the model. 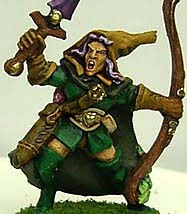 The grey is perfect for me without altering the base colors like a black primer would be prone to do here. And then we get right to work with this guy. Keeping mind he's a rank and file guy (I'm assuming since I know nothing about the army itself), he'll need to be painted both quick and to a nice standard since I'd most likely be painting a bunch of them. The trick is to minimize the steps required and maximizing the results for each step. TRICK: Take a minute before jumping into painting and plan out your steps. Sometimes it's better to paint one color before another in order to eliminate a step or prevent yourself from having to go back and fix things. With this model, I worked from light to dark the whole way through the model. 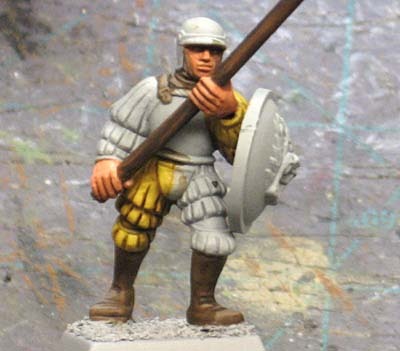 The yellow is nothing more than thinned down GW Foundation Iyanden Darksun and the browns are two different shades to help differentiate between his leather boots and the spear. The skin is GW Dwarf Flesh. With those areas basecoated, it was time to bring out the details. A series of washes followed by repainting the base color over that as the highlight was all it took. TRICK: GW Devlan Mud is not the answer to everything. That's right, if you keep practicing with washes, there will come a point when you want to work past GW Devlan Mud and look for better options/washes. I'm not saying different brands, but using different colors. Could I have just washed the whole thing with Devlan Mud? Sure, and it would have looked it too. I could have dipped the model in the end too and came up with similar results. Are these bad options? No. But we're looking for a bit more here. We want the model to be painted quick, but we're looking for that extra touch too. So what do we do? Easy, we use a few different washes on different areas. It will help bring the model to life in the loing run. In this case, I used Ogryn Flesh on the skin, Gryphonne Sepia on the pants and sleeves and Devlan Mun on the leather and spear only. Just the simple act of changing out the wash color helps with the overall look of the model. ONce those were dry, I went back in with the orginal base colors and hit some highlights in each area. TRICK: You can take your washes and go back and use them in key areas to reinforce the shaded portions. This will help add contrast without muting the model. In this case, I did that on the pants. I went back in with Devlan Mud and added it to the deepest folds only. I didn't just throw it all over the model, but I carefully applied to to a few spots to push the contrast. And then the blue, using everything I just learned with the yellow, I repeated the process and changed the colors. Add another wash of Asuremen Blue to the recessed areas only. At this point, the only thing left is the base and the metal areas. The metal portions get a quick basecoat of black which will clean up all remaining mistakes you may have made up to this point. See how working from dark to light has helped us keep a clean looking model without having to paint within tiny sections the whole time? Of course we'll need to be careful with applying our black, but it that's the only color we have to do this with. Here's the process for the metal areas. While it may seem like a lot, it goes quick. The idea is to create a weathered and worn looking metal for this guy. Same goes for his helmet and breastplate. And the finished model. A quick coat of brown on his base followed by some light brown drybrushing and lots of static grass and he's all done. So this week shows us that it's possible to paint a model from light to dark and you don't always have to go from interior to exterior. It just takes looking at the model, looking at the colors you plan on using and going from there. Make sure to check out Dave's Fantasy model for this week. He's got a great looking Elf model with a good amount of detail on it that he's able to finish quickly with a few key techniques. As always Ron, you make an incredibly good paint job look effortless. You're tutorials are highly appreciated. Many thanks! 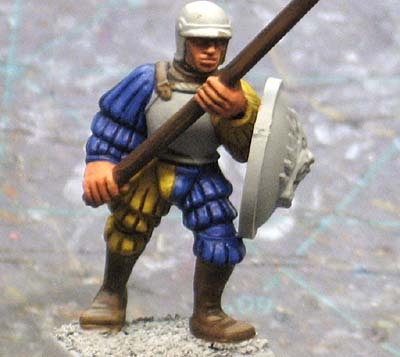 Is there any way you can include a picture or advice on how to paint sections like the fold of the arm under the shield in the future? I find that any area that's got something "blocking it" gives me difficulty in painting. That rank and file soldier looks really good. Maybe you should paint a whole army :) Doesn't look like a cut corners type of job at all but neat and weathered at the same time. Loquacious: Actually there are two quick ways to solve your problem. 1. Skip it. If you can't see, neither can anyone else. 2. Depending on your process (like this goes from light to dark colors), you can slap the paint on just to get some color on there and clean up mistakes later as you get to the dark colors. Myself, I prefer option #1. Flekkzo: I've got a 40k army to finish first.